Distribution in scandinavian waters Maximum length: It is difficult finding information on their maximum size, but you can compare the size of a larva with a hair. Appearance: Snail veliger have a spiral shell and a number of wrinkles known as a velum. These can be divided in up to 6 flaps and are furnished with cirria. Antennae are often seen and there is a distinct foot. Compare the snail veliger with the limacina naked sea butterfly. Depth: From sea level to unknown depth. Misc: When the eggs from a great many specie hatch, larvae appear. During this first stage, the young larvae seldom resemble their parents and often live another life style. 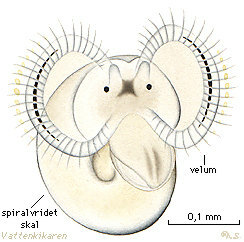 Many shellfish have two larvae stages; the first when they are known as trochophora larvae, then the second when they develope into snail veliger. This is the case amongst the common periwinkles and the mud snails. Snail veliger are seen almost exclusively only during the summer and the time spent as a larva can vary greatly between the different specie, from only a few minutes to several months. The larvae derive their nutrition from the egg and small organisms in the surrounding water. The food is caught, transported and sorted by the velum which is also used for swimming. Many of the larvae are eaten by suspension feeders. Classification: Snail veliger are found amongst certain snails under the mollusc group.